We're working in the area and in need of a late lunch - the two closest options are Axil Roasters and Chester White and as you can tell, we've tumbled back for another visit at Chester White. 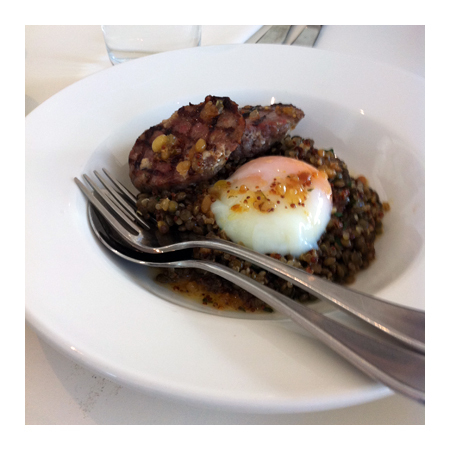 We had a couple of dishes to share as we wait for our pizza - the first are those rather excellent Lamb Ribs and this special dish of the day - it's slices of a cotechino like sausage, grilled and served with an excellent braise of puy lentils topped with a wonderfully soft, slow cooked egg. 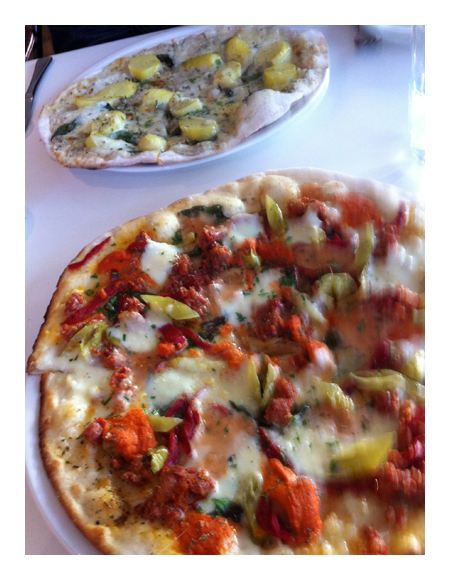 Both pizzas were an improvement on the last visit - lovely thin and crisp crusts on both, not too much topping - the Spaniard was a little wet but the Potato was just right. The Spaniard was actually quite nicely spiced, milder than either one of us had expected, I think it might just be that the subtle sweetness from the membrillo that rounded out the flavours.